So, You are Looking to Own a German Shepherd ? The GSDCV has provided a list of Breeders who currently have puppies available (bottom of page, if listed if available). Some Breeders advertise that they are “a member of the German Shepherd Dog Club of Victoria Inc.” This DOES NOT mean that the Breeder follows the German Shepherd Dog Council of Australia (GSDCA) Breed Improvement Schemes and the GSDCV Code of Ethics. THE GSDCV RECOMMENDS THAT YOU PURCHASE YOUR GERMAN SHEPHERD PUPPY ONLY FROM A BREEDER WHO ADHERES TO THE STRICT GSDCA BREED IMPROVEMENT SCHEMES AND THE GSDCV CODE OF ETHICS. These are puppies that you will find listed below. Breeding animals should have the following: An ‘A’ stamp for Hip dysplasia which indicates that the animal has passed the GSDCA Hip Dysplasia Scheme and is suitable to be bred from and a ‘Z’ stamp for Elbow dysplasia which means that the animal has passed the GSDCA Elbow Dysplasia Scheme and is suitable to be bred from. Also Breed Survey Classified (BSC) which means that they have been presented before a panel of experts that have ascertained and documented that the animals are suitable anatomically to be bred from and have passed a temperament test and a gun test which is their reaction to loud noises. The Breeder should be able to show you documents that verify that the parents have successfully passed these schemes. IF THE BREEDER DOES NOT FOLLOW THESE GUIDELINES YOU NEED TO ASK “WHY NOT” ? As such he has an active mind, which must be stimulated. You must be prepared to provide your German Shepherd with a daily walk, playtime and obedience training so he can become a reliable canine citizen and well adjusted family member. Of course the exercise will be good for you too! We recommend you buy a burglar alarm! Whilst the German Shepherd is naturally protective he does not cope well being confined and isolated without socialisation and as has already been stated requires mental stimulation. Failure to understand this can lead to behavioural problems. 3. Have you got adequate facilities for your German Shepherd? You will need a secure, safe and fully fenced yard with adequate shelter from all the elements and access to fresh clean water. Your yard must be “escape proof” as the law prohibits roaming dogs. Bailing your dog out of the pound can be costly, assuming you are lucky enough to find him there if he goes missing! 4. Can you afford a large dog? Costs can run into many thousands over the course of your dog’s life. These may include, in addition to the purchase price, possible vet bills, feeding, Council registration, Membership fees (i.e. 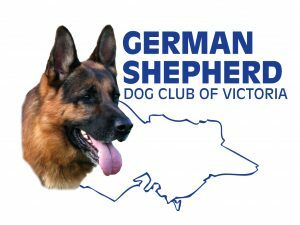 the German Shepherd Dog Club of Victoria and Dogs Victoria), micro-chipping etc. 5. Are you prepared for a 10-12 year commitment? This is the average life span of the German Shepherd. Are you prepared to accept this long term responsibility to care for your dog for the duration of his/her life? Think about it. 6. So you still want to own a German Shepherd? You are a committed, responsible and active person ready to make a german shepherd an integral part of your family. 7. NOW! – Where do you buy your German Shepherd puppy? Through the German Shepherd Dog Club of Victoria, Puppy Listing Service. We do not recommend buying from unregistered breeders. A puppy that is purchased through the GSDCV Puppy Listing service comes from a breeder who is a member of the GSDCV, and has complied with all of the Breed Improvement Schemes and Breeding Guidelines relating to breeding and rearing of their puppies. This will provide a greater assurance that you are buying a quality puppy that will have less chance of suffering from the hereditary diseases that may occur in the German Shepherd Dog. – All puppies come with a Dogs Victoria (VCA) Registered Pedigree – providing proof of breeding and parentage. – The price of puppies is very similar to that from a Pet Shop or other online advertising websites, but they cannot provide any of the above. If you are interested in a German Shepherd puppy, check out the available litters detailed below. 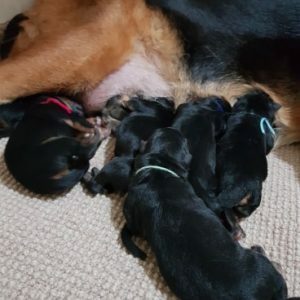 The German Shepherd Dog Club of Victoria advises that the details listed in this Puppy Listing are authorised for publication by the breeders concerned. The German Shepherd Dog Club of Victoria offers no warranty of any kind in relation to any puppies offered for sale by a Breeder through the Puppy Listing service. The GSDCV has been advised that any breeders contained in this listing have/will abide by the Regulations as set down by the GSDCV. The German Shepherd Dog Club of Victoria does not enter into any negotiations between the Breeder and buyers and remains an independent entity. The Committee of the German Shepherd Dog Club of Victoria reserves its rights to decline or withdraw any listing or cancel this site without prior notice. These puppies will be raised in a family environment and I expect them to be happy, outgoing, confident puppies who have been exposed to a variety of different situations. Both parents are hip and elbow x-rayed and breed surveyed. All puppies will be fully registered with Dogs Victoria, vaccinated, microchipped and regularly wormed. I have a letter from my vet to state that it is not in the best interests of the puppies health to microchip prior to six weeks of age. They come with a Puppy Pack including comprehensive information, a diet sheet, four free obedience lessons with the German Shepherd Dog Club and a supply of food to get you started. Some of these puppies will be available to forever, loving homes so if you think you would like to make one of these babies part of your family, please contact Arlene on 0425724909. Texts will not be answered. Coat, 3 Stock Coats. Vaccinated, Microchipped, Fully Registered with Vic Dogs, puppy pack. Excellent Temperament. Breed Surveyed Parents. Please Call Marie on 0407361859.